Re: How do bacteria produce energy without a mitochondrion? Hi. Thanks for an interesting question. As you probably know, mitochondria produce energy by generating a gradient of hydrogen ions (aka, protons) across a membrane. This process is crudely outlined in the diagram below (note, this is a cartoon; nothing here is to scale). 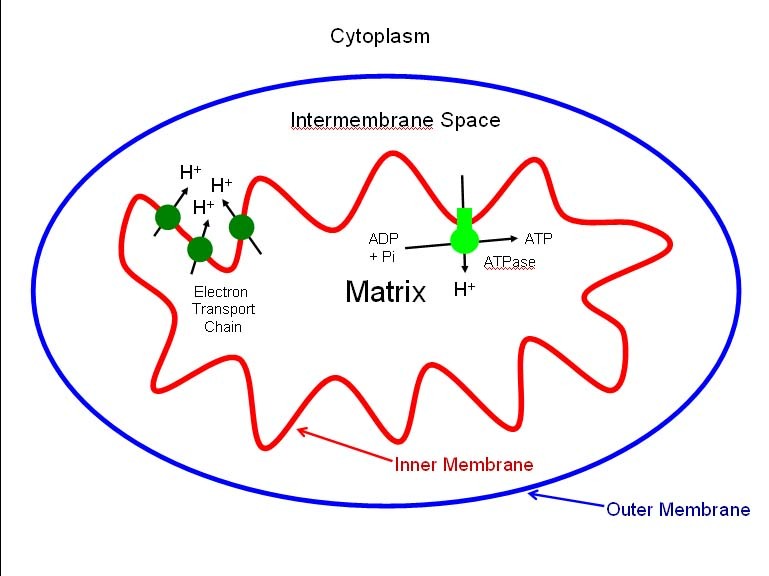 As you can see, mitochondria have two membranes (inner and outer), and membrane-bound proteins in the electron transport chain pump protons from the mitochondrial matrix into the intermembrane space. This is sort of like forcing air into a balloon; the pressurized air you forced into the balloon can be used to do work when you open the neck of the balloon, like turn a pinwheel, or make the balloon fly away. So too, an electrical potential develops across the inner membrane that generates a proton-motive force that will drive protons back into the matrix through a suitable channel. The suitable channel provided is usually the ATP synthase complex, which uses the movement of protons across the membrane to generate ATP from ADP. But, as you point out, Bacteria don't have mitochondria. So, how do they generate new ATP? Well, a few ATP can be generated via glycolysis, the oxidation of a six-carbon sugar (glucose) to two three-carbon products, like pyruvate (which is then transported into the mitochondrion) or lactic acid (when there is no oxygen available) or to two two-carbon products, like ethanol (in yeast) and two carbon dioxide molecules, when there is no oxygen available. However, glycolysis only generates two ATP for each glucose. You might not know about the endosymbiont theory, which explains why mitochondria have multiple membranes and their own chromosome, which encodes genes for tRNAs, ribosomal RNAs and some proteins. It turns out that the ancestors of mitochondria were bacteria that lived as independent cells hundreds of millions of years ago! You can read more about the endosymbiont hypothesis in this excellent answer and this excellent answer by Mike Klymkowsky. So, if mitochondria are descended from bacteria, maybe bacteria have a system similar to mitochondria for generating ATP. In fact, they do, and I have included a second diagram below that outlines it (again, nothing here is drawn to scale). Here, you can see that bacteria also have two membranes. The cell or plasma membrane is surrounded by a cell wall, and the cell wall (at least in gram- negative bacteria) is surrounded by a second, outer membrane. The space between the cell wall and the cell membrane is called the periplasmic space. These two membranes then correspond to the inner and outer membranes of the mitochondria. The bacterial cytoplasm corresponds to the mitochondrial matrix, and the bacterial periplastic space corresponds to the mitochondrial intermembrane space. 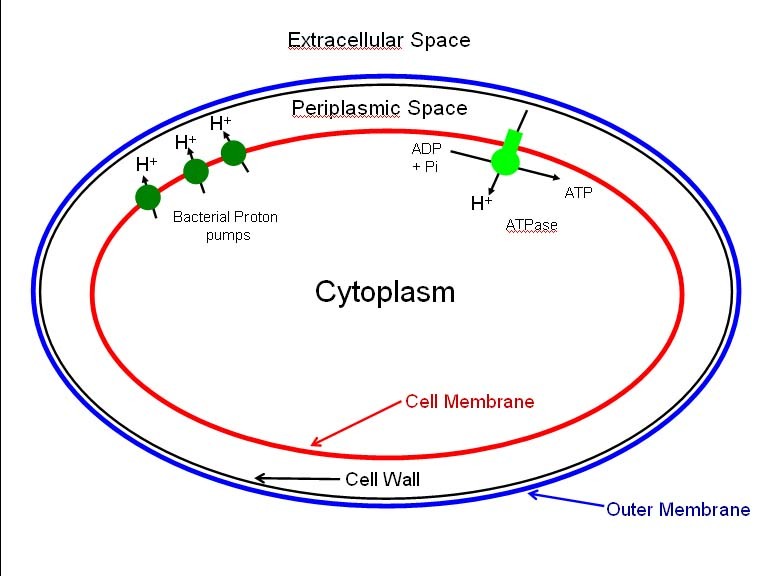 As you can see in my diagram, bacterial proteins in the cell membrane pump protons into the periplasmic space. These might be electron-transfer chain proteins, as in the mitochondrion, or they might be a protein like bacteriorhodopsin, which captures light energy (photons) and pumps protons out of the cytoplasm, and into the periplasmic space. As with the mitochondrion, a bacterial ATPase lets protons (under the protonmotive force) into the cytoplasm, using them to make ATP. So, though they don't have mitochondria, bacteria can generate energy through glycolysis and by generating a proton gradient across their cell membranes! Unlike mitochondria, some bacteria can use light to generate a proton gradient, and therefore ATP. You can find out more about these topics by reading a good college-level biochemistry textbook, like Biochemistry by L. Stryer. The version of Stryer I linked to there is searchable, so you can type in all of the terms I used here to find out more about them.